The Temporary Tattoo Store, by Glitter Body Art, are the UK’s No 1 supplier of glitter tattoo stencils, tattoo kits, glitter & accessories. Our temporary tattoos give you glittery, shimmery, multicoloured tattoos which are painless to apply and will last up to 7 days!! We have a large range of tattoo kits to get you started, from small personal kits to large business kits. The kits contain everything you need to create your very own Glitter Tattoo and with full instructions enclosed, it could not be easier. These tattoos are suitable for all age groups and we use hypallergenic cosmetic glue so it is safe for all the family. We do not recommend using them on the face. We also stock extra accessories such as stencils, many different coloured glitters and the cosmetic glue. Our products are perfectly safe as we use hypoallergenic materials to ensure that it is safe as well as using special ultra fine cosmetic glitters and cosmetic gel to make sure that your skin is safe at all times. We do not recommend using our body adhesive on the face or reusing a stencil. Our Glitter Tattoos are waterproof so you may bath or swim but prolonged damp skin may decrease the life span of your tattoo. If you wish remove your tattoos then you can simply use baby oil or any oil based lotion to remove it. 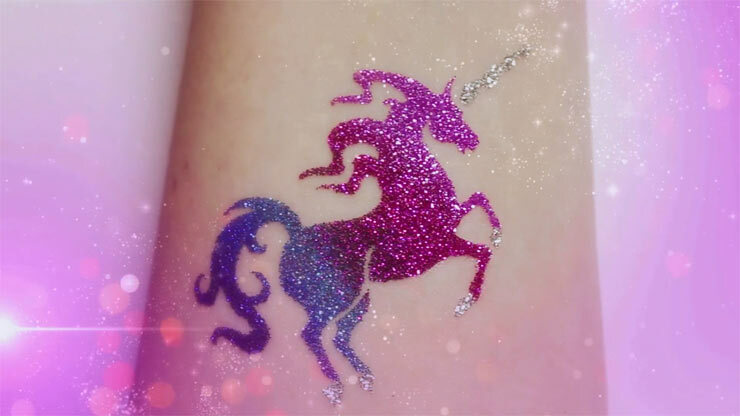 See how you can use our stencils & glitter to create fantastic Temporary Tattoos, great for adding a bit of sparkle to your party! We have a huge range of glitter tattoo stencils to choose from. I am a make up artist and found the cosmetic glitters to be fabulous quality, lovely colours and brilliant to work with! Love Glitter Body Art! Glad I found this company! Been looking for face painting stencils for the rugby & found these guys. Got my order delivered 2 days after… and it’s great! Will shop here again! The glitter, cosmetic glue and stencils are amazing!. The glitter is incredibly fine, there’s loads of it and very high quality with a huge range of colours to choose from it. The glue is the best I’ve ever used especially the wand applicator, it’s brilliant!. The 3 layer stencils are of high quality, really easy to use with a fantastic selection and some of the best designs that I’ve found on the Internet. P&P is always quick which I’m always pleased about as I’m not very patient when it comes to waiting for my order. Brilliant customer service….. would highly recommend.